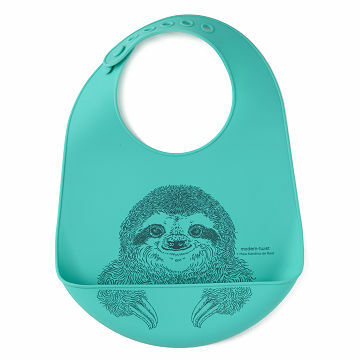 This reusable, crumb-trapping bib sports adjustable straps and the likeness of a smiling sloth. Trap errant crumbs and saucy splotches in their tracks—even if they're moving suuuuper sloooow—with this soft, reusable, plastic-free bib. Shaped like a bucket to capture any edible cast-offs, this bib sports adjustable straps and the likeness of a smiling sloth, so kiddo can dine in comfort. Meanwhile, you'll be grinning, too: Sturdy silicone construction means no need to toss after a single use, and with fewer spills, you'll spend less time cleaning at meal's end. (That's what we call a "win-win.") Made in China. Make sure to clean spills promptly to avoid staining bucket-bib and avoid punctures by keeping it away from sharp objects. Bib is heat resistant to up 250 Celsius or 425 Fahrenheit. This bib is easily washable and catches any dribbles! The cutest and softest bib for my babe! My son loves wearing this cute sloth bib to eat. This was such a unique item to add to our friends' gift for the birth of their baby! IT's very practical & useful & cute.